This light blue oxford hat is embroidered in white and navy for a very fashion forward look. The back has a cloth strap and antique brass buckle to adjust to most sizes. 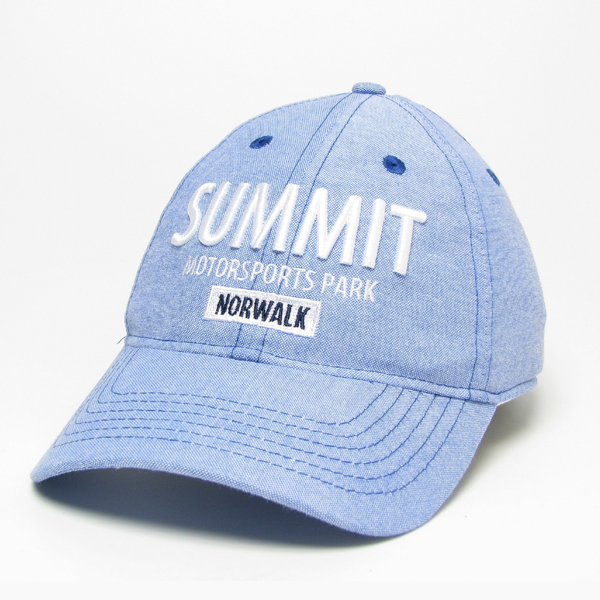 You will love our 100% acrylic Summit Beanie with the logo stitched right into the hat. This will be your go-to hat from early fall, through winter. Our ladies visor made of red oxford cloth contrasts nicely with the navy embroidery across the front. A cloth strap and buckle are used to adjust to most sizes. Our gray screen printed fabric front combines perfectly with colored mesh and thick contrast stitching for an awesome West Coast look. This hat features 100% cotton twill front panels & brim. The red and white embroidered logo is done with corded foam.